Gum disease is Weatherford is an all-too-common oral health issue. The National Institutes of Health (NIH) estimate that more than half of Americans over the age of 30 suffer from bleeding gums–or worse. Dr. Deborah Romack and Dr. Garrett Mulkey, Weatherford dentists, treat gum disease and show patients how to take care of their mouths for best oral health. Unfortunately, research links the effects of gum disease to areas of the body outside the mouth, increasing the chances of cardiovascular disease, diabetes, hypertension, rheumatoid arthritis, dementia, pregnancy complications and other serious problems. 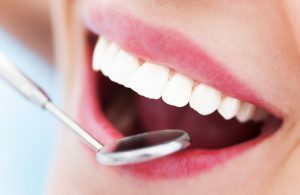 That’s why your professional team at Cosmetic & Family Dentistry in Weatherford asks patients to visit the office twice a year for oral examinations and hygienic cleanings for removal of bacteria-filled plaque and tartar. Mild gum disease, or gingivitis, responds well to regular hygienic cleanings and everyday brushing and flossing at home as advised by the American Dental Association. The doctors also recommend antibacterial mouth rinses and drinking plenty of water daily to stimulate the production of saliva and its beneficial antibacterial properties. A diet low in sugars and starches and high in fiber, low-fat dairy and protein nourishes both the hard and soft tissues of the mouth. For more advanced gum disease, or periodontitis, Dr. Mulkey and Dr. Romack perform deep cleaning and root planing. This in-office procedure removes deposits of plaque and tartar from below the gum line and also smoothes root surfaces so gums successfully reattach. The dentists may want to see their periodontal therapy patients more often than the usual every six months. More frequent cleanings and examinations, combined with persistent home hygiene, keeps gums pink, intact and healthy. This is another good reason for more frequent prophylactic treatments. Yes, gum disease can run in families. In addition, people who smoke and who abuse alcohol definitely put themselves at risk for gum problems. Drs. Romack and Mulkey recommend seeing your primary care physician for treatment of these issues. Additionally, people who are immunosuppressed due to cancer treatment or HIV and individuals with difficulties in blood sugar control benefit from more frequent dental visits. If it’s time for your routine check-up and cleaning, or if you see some bleeding when you brush, call the office for an appointment. With care, your gums can feel good, look good and do the job they are meant to do.